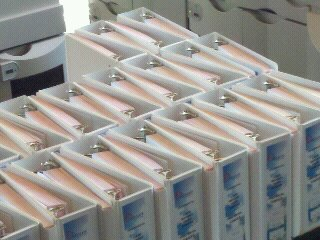 North Carolina's Ultimate Binder Printing Service, Guaranteed! Make sure your presentation and study binder projects are made in Durham, North Carolina, by the most consistent, and highest quality print specialist in the area. We build and ship vinyl binders under one roof with FAST turnaround times and FREE local delivery. Choose the printer with over 30 years of excellence, trusted local customer service, an award winning in-house design staff and the most affordable mailing service in the area. Get a custom quote today and see why Universal Printing is the most recommended Business Binder and Personal Binder Printing Service in North Carolina. Trust the provider for top Contract Research Organizations in Durham, Raleigh, Chapel Hill and around the globe since 1979. We offer quality, eco-friendly stocks with the fastest turnaround times in the business. Have us tailor a quote that meets your budget and needs, whether you need a few digital binders or several thousand printed on our six color printing press. We offer only the best printing methods and services that will make your binders stand out and exude quality. Binders are a popular and economical way to reach your employees and customers, so have us help you get started on a project today. Just give us a call at 919-361-5809, request a free estimate online, or stop by and speak with a printing specialist today! Thanks Universal! When we needed 2,000 binders printed right away and our current vendor couldn't do it, you helped us get the job done in a hurry.